Today’s recipe is another paneer based dish which is served as a sidedish for roti which all of you might be well aware of – Kadai paneer. 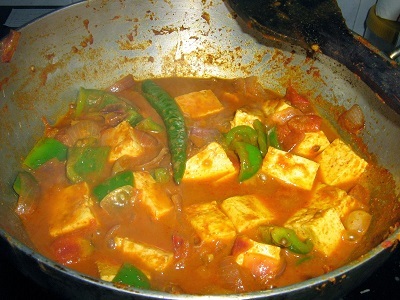 The name is “kadai paneer” derived from the way it is cooked. In India, kadai means a “wok”, not like a Chineese wok, Indian wok is much deeper. 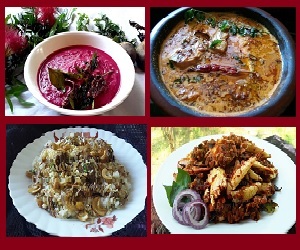 Among the many paneer recipes available, paneer butter masala, matar paneer, kadai paneer and palak paneer are very famous and is liked equally by everyone. 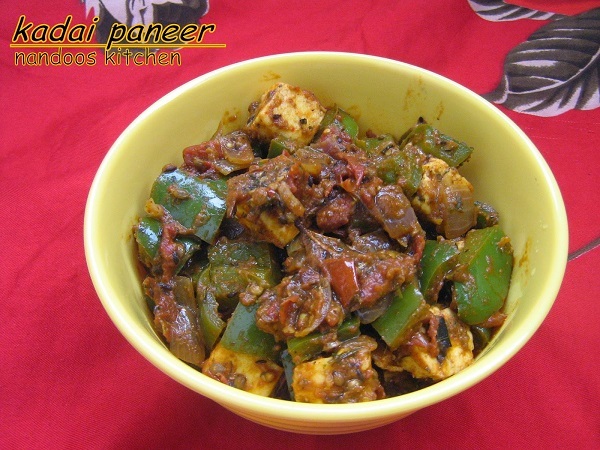 Kadai paneer is a tasty and easy to make paneer dish where paneer (Indian cottage cheese) is cooked along with capsicum in a spicy kadai masala. It is my daughter’s favourite and she always orders this whenever we visit any restaurant. 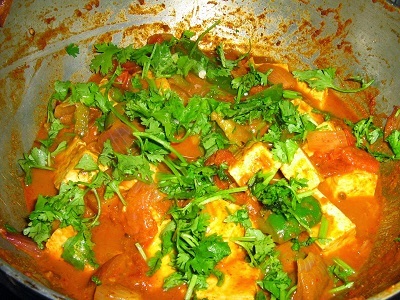 Kadai paneer is a very tasty dish and can be prepared in less than 20 minutes. So this means you can make this tasty dish even when you are in a hurry, early in the morning or even during evening hours. 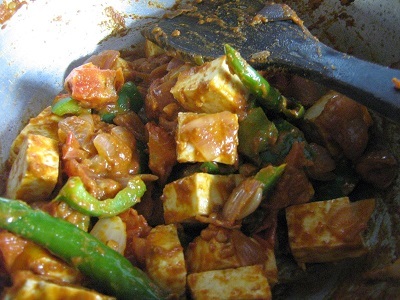 The masala needs to coat the paneer cubes well and the juices should be well absorbed by the paneer to get the right taste. 1. 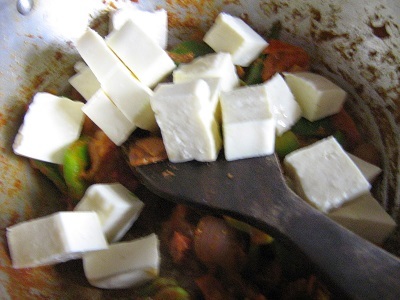 Cut paneer into cubes. (You can also cut it in triangular shapes). 2. Dice capsicum into cubes and keep it ready. 3. Heat a pan, dry roast cinnamon, cloves, cardamom, coriander seeds, dry red chilly and keep it aside. Roast it in low flame so that the ingredients do not get burnt. Let it cook and then make a fine powder and keep it aside. 4. 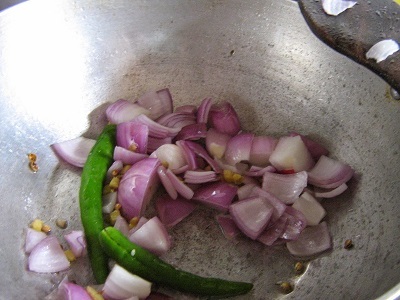 Heat oil/ ghee in a pan, add cumin seeds, when it sizzles, add bay leaf, onion, ginger garlic paste, chopped green chilles and saute them till onion turns translucent. 5. 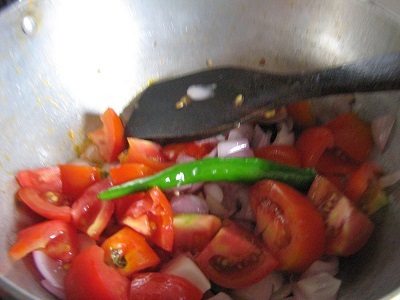 Now add tomato, a pinch of salt, and saute it well until tomato turns mushy. 6. 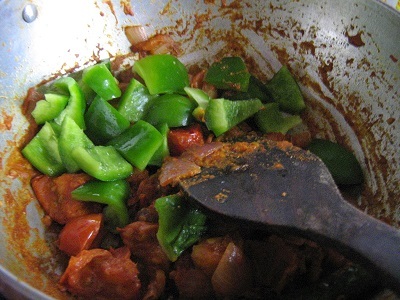 Now add capsicum, turmeric powder, red chilly powder, coriander powder, salt and little water (1/4 cup), mix well. Cover the pan with a lid, reduce the flame and let it cook for 3 – 4 minutes. 7. 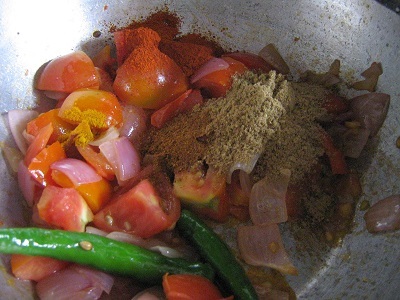 Now add paneer cubes, the ground masala, coriander leaves and mix well. Again add little water if you feel that the curry is dry. Cover it with a lid, reduce the flame and again cook for 5 – 6 minutes. 8. Switch off the flame and add crushed kasuri methi. 9. Keep it covered for some time so that the flavours and juices get mixed well with paneer. 10. This can be served as a side dish for roti. If you find this post useful, I would be extremely happy if you can share it with your friends in google+, facebook or twitter.